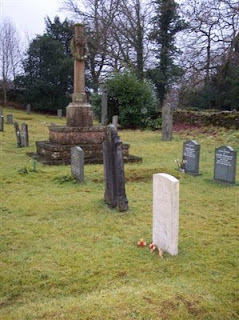 (1 & 2) Holy Trinity Churchyard, Winster, Cumbria. At the beginning of 1945, the 2nd Battalion The Border Regiment formed part of the 100th Brigade and 20th Indian Division. For the next few months - until the end of the war in the Far East in August 1945 - the 20th Indian Division played an active part in the Allied advance through Burma, pushing the Japanese forces back from west of the Irawaddy river. Among those serving with the 2nd Battalion The Border Regiment at this time was Corporal Wallace H. Hartley. His wife and children were then living in the village of Oulton near Wigton, Cumberland, but Corporal Hartley originally came from the West Cumbrian village of Cleator. Unfortunately, he was to lose his life during the advance through Burma, dying of wounds on 1 March 1945 after the jeep in which he was travelling on the road to Mandalay was blown up by a land mine. Local children regularly visit the Oosterbeek War Cemetery, Netherlands and look after the graves, lay floral tributes and remember the names and the lives of the young men whose names are engraved on a headstone or the Arnhem - Oosterbeek Memorial. Recognising this care for their former comrades the Arnhem Veterans Club commissioned a plaque at the entrance to Oosterbeek War Cemetery entitled 'Flowers in the Wind'. Among the Allied Airborne troops who landed in the Arnhem – Oosterbeek area during Operation ‘Market Garden’ in September 1944 were parachutists. Dutch civilians on the ground thought that these thousands of parachutists in the sky looked like flowers in the wind. Some of these Parachutists, and others who landed in gliders, would never leave the area alive. If you were to ask the question ‘Where have all the flowers gone?’, then look at the graves in the cemetery. At the end of October 1943 Rifleman John George Mossop (known as Jackie) of 33 Bowthorn Road, Cleator Moor, Cumberland was repatriated from a German Prisoner of War Camp. After a long spell in a military hospital in N.W. England he was eventually declared incurable and sent home to die. 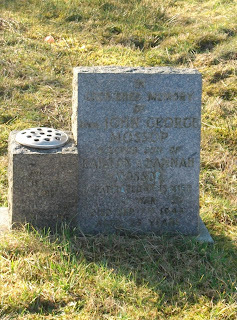 After three weeks at home, Jackie Mossop passed away on Thursday 7 September 1944. Jackie Mossop's funeral service took place two days later on Saturday 9 September 1944 at St John's Anglican Church, Cleator Moor (Photograph No 1 above). 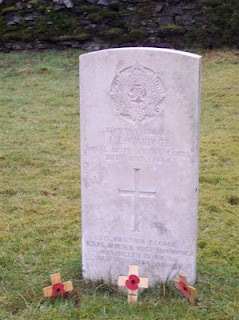 He was then laid to rest in the churchyard and his grave is marked by a family headstone (Photograph No 2). 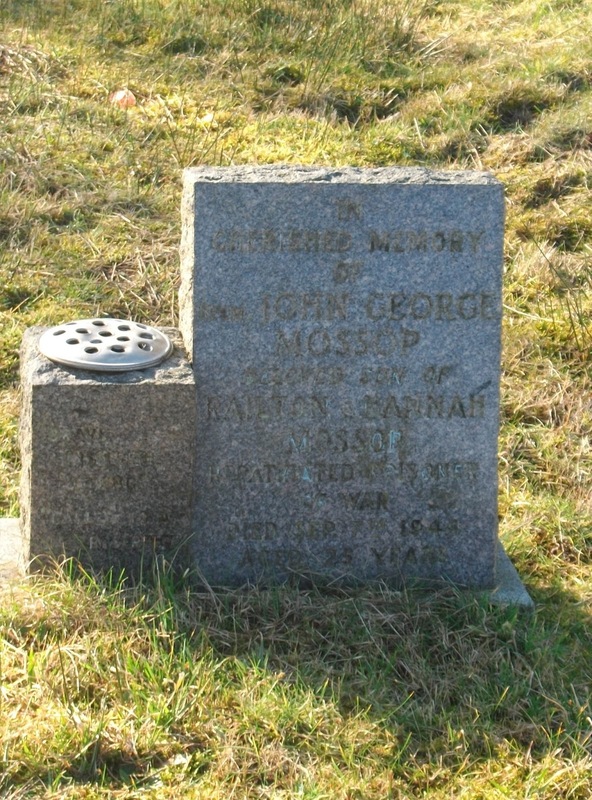 Despite his wartime service and death Jackie Mossop is not commemorated by the Commonwealth War Graves Commission. 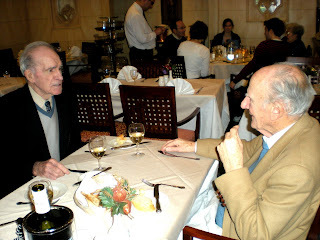 I have been asked and am pleased to post the following article on behalf of Catherine L.
Few people are aware that up to 20,000 Jewish refugees, from Germany and Austria mainly, were able to find a refuge in Shanghai, China. No visa was required to get there as late as 1939, when most, if not all, the countries in the world were closing their doors to them. It was called 'the Port of Last Resort'. Many survived, if in very uncomfortable conditions, as they were helped by Jewish charities run by the families who had settled in Shanghai long before the war, like the Sassoons, or the Kadooris. They developed a whole cultural life among themselves, opened schools and ran newspapers; life had to go on... The Chinese themselves never showed any hostility towards them, on the contrary. When the war was over the refugees were able to emigrate to The USA, Australia, Canada... a few returned to Europe, some to England,having sometimes spent up to eight years in China. Flight Sergeant Harry Heald Bawden, RAFVR, was a WW2 casualty from Cleator, Cumberland. He is commemorated on the Cleator Moor ‘Roll of Honour’ and his name is also one of 10 WW2 casualties listed on the Trumpet Terrace, Cleator War Memorial (for those who lived in that part of Cleator village). 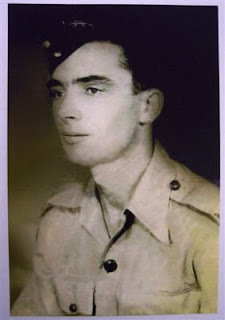 "After all these years ..."
Lance Corporal Patrick McCarron (known as 'Paddy') lost his life during WW2 at the age of 27 while serving with the 2nd Battalion Royal Berkshire Regiment in the Far East. 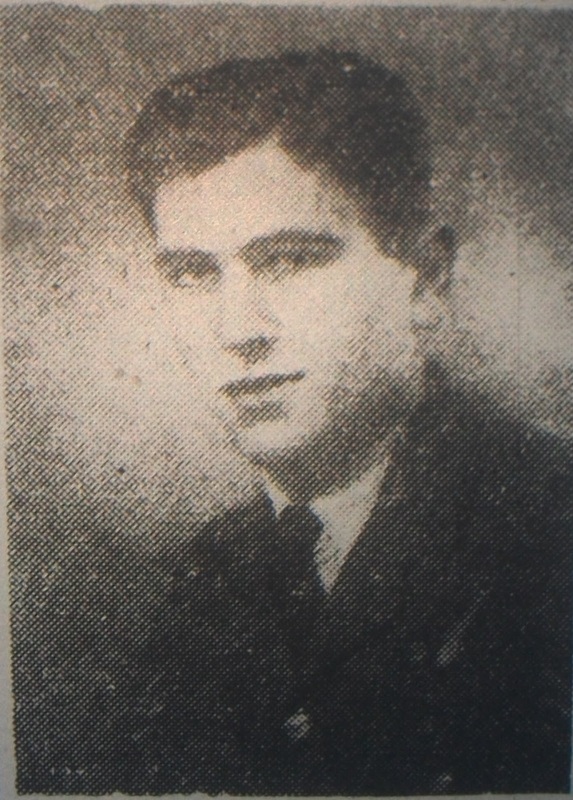 Paddy died in the last year of the war, on 28 January 1945, and is buried in Taukkyan War Cemetery (Grave Ref: 26.C.20). Paddy McCarron came from the West Cumbrian town of Cleator Moor and originally signed up to serve with the Border Regiment, the local Regiment for his home area. His service number was 3601780. In front of the War Memorial at Cleator Moor on Remembrance Sunday 2008 I met Lance Corporal McCarron's brother. Mr McCarron told me he attends the Remembrance Sunday memorial service each year and remembers not only his brother Paddy but other people he remembers from the Cleator Moor area who gave their lives during WW2. (L-R): Bishop Hitchen, Angelina O’Brien, Father D. Murphy. The following article about the wartime Greece was written by Mrs Angelina O'Brien (née Marcoulatou). Angelina married a British soldier, Pat O’Brien in December 1945. They made their home in Whitehaven, Cumbria. After WW2 the O’Brien family have undertaken voluntary work and fund-raising for charities such as OXFAM CAFOD and Amnesty International. 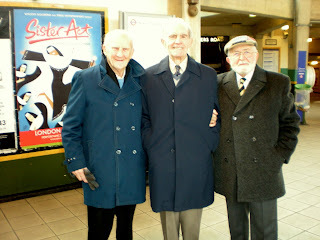 “I came to Whitehaven from Greece after I married my husband Pat O'Brien on 31 December 1945. In Greece, my family were forced to sell and relinquish all our land and property just to survive during the wartime Nazi Occupation. We had to survive on eight ounces of bread a day. My main duty was to find, and then haggle for, food on the Black Market. Money had no value then. We had to barter for everything. My brother was in the Greek Resistance and was eventually caught by the Germans. My sister sold the remains of her dowry to buy his freedom. Everything else had been sold to buy food. We were absolutely starving. Luckily we survived. We saw the dead body of someone recently shot by the Germans and thought it was our brother. When we went to look, the Germans began shooting again. We just ran as fast as we could. Thankfully, our brother survived the war”. After much planning and top level conferences a meeting finally took place in Cockfosters on Friday the 2nd of January 2009. 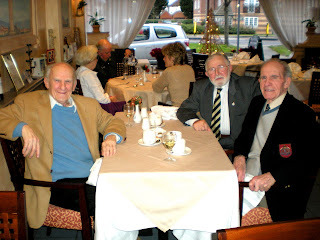 At the meeting were Gerry Chester (well known expert on tank warfare and late of the North Irish Hussars) Tom Canning (late of the 16/5th Lancers and other noted RTR regiments) and Ron Goldstein (diarist, photographer, bon viveur and late of the 4th Queen's Own Hussars).